It is inevitable that we use software we already know as a basis for comparison when learning new software. When learning a new DAW I always find myself looking for an equivalent to a familiar feature in my DAW of choice. People new to Pro Tools are often put off by some significant ways in which it differs from the way some popular DAWs. One such area is the lack of a dedicated sample editor and I am often asked by new users where they go to edit a sample only to be told they are already there. Its kind of obvious when you think about it but the clue really is in the name in this case. The edit window is the place where sample editing takes place. It makes me wonder why other DAWs find it necessary to have a dedicated editor at all? Editing down to sample level is possible without ever leaving the edit window but to really take advantage of this use of zoom toggle can really help. Often when editing audio it is desirable to see the audio in context with surrounding material and the layout of the edit window allows this but for the kind of detailed editing which would usually be performed in a sample editor it can be useful to quickly zoom in on the material being edited so that it fills the screen. Zoom toggle can achieve this with a single keystroke. To quickly fill the entire screen with the current selection either click the zoom toggle button in the toolbar (highlighted above), the arrows on the icon give a clear idea of its function. The D Control has an equivalent button (pictured above) the amusingly titled “Explode” button which isn’t nearly as dramatic as it sounds! If your command focus keystrokes are focussed to the edit window (as opposed to the groups list or clip list) then pressing E will toggle zoom and if your command focus is not focussed to the edit window then Ctrl+E (Start+E) will work instead. To zoom back out simply press E again. For zoom toggle to work in the most useful way I would recommend visiting the zoom toggle preferences (found under the editing tab in prefs) and changing the track height from the default to “fit to window”. That way when toggling, the edit selection (which can span multiple tracks) will expand to fit the window both vertically and horizontally. There are other options for zoom toggle in prefs but over many years this is the only one I always change. The main difference between sample editing in Pro Tools and in dedicated sample editors in other DAWs is that sample editing in a dedicated editor is usually destructive. In Pro Tools editing is almost always non-destructive. If you want to “bake in” your edits the simplest way is to consolidate your selection, which will render a new file. Adding option (alt + shift on PC) will leave zoom toggle without changing the current level of zoom. 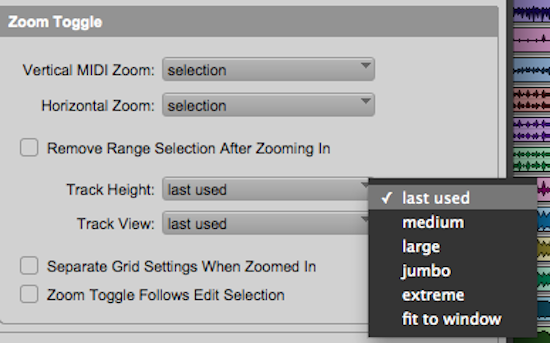 Useful if you want to zoom in even further when using Zoom Toggle. If you don’t already use them, then use of this feature in combination with the recommendations I made in my Session Navigation In 5 Shortcuts will speed up your use of the edit window and make your Pro Tools time more productive.